Let’s go back to the basics for this one. Everyone reading this at least knows what HTML is. I believe that, no matter what experience level someone has, reviewing the foundation can help increase knowledge. It also helps to hone skills, especially with the constantly evolving technologies that drives the Internet. There has also been a lot of talk of change with HTML 5. 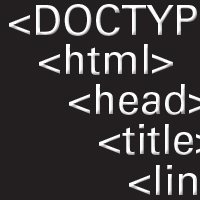 Every tag that I mention below is supported in both HTML 4.01 and HTML 5. While some of these tags are already widely used; I would like to challenge some of the ways that we use and think about them. puppy on From The Web To Jail: 6 Computer Crimes You Can Get Arrested For! Khalid Rashid Qasim's Blog, AKA Foksh.